I think we can all be divided into two camps at the moment, those who have been driven stir crazy by the recent Snapchat update, and those who are unaffected/unaware. 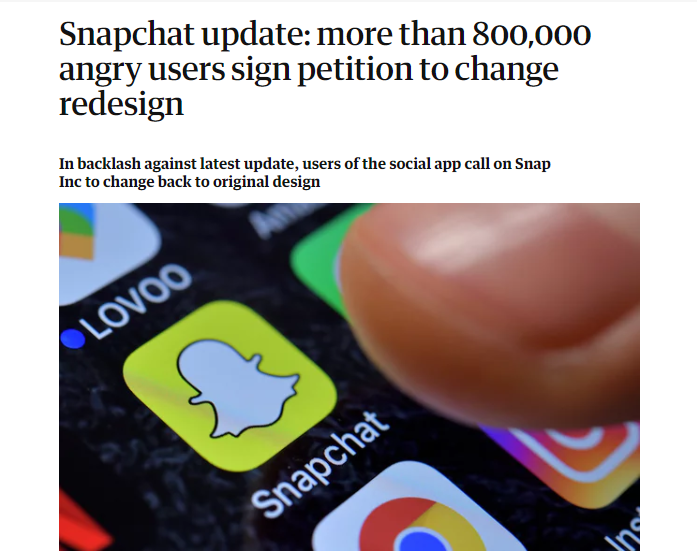 Snapchat users are up in arms about the latest interface redesign, that has changed the entire user experience; and according to widespread opinions online the change is not exactly for the better. I for one was a bit perplexed by the changes on Snapchat, for me it was a case of “wait, what?! 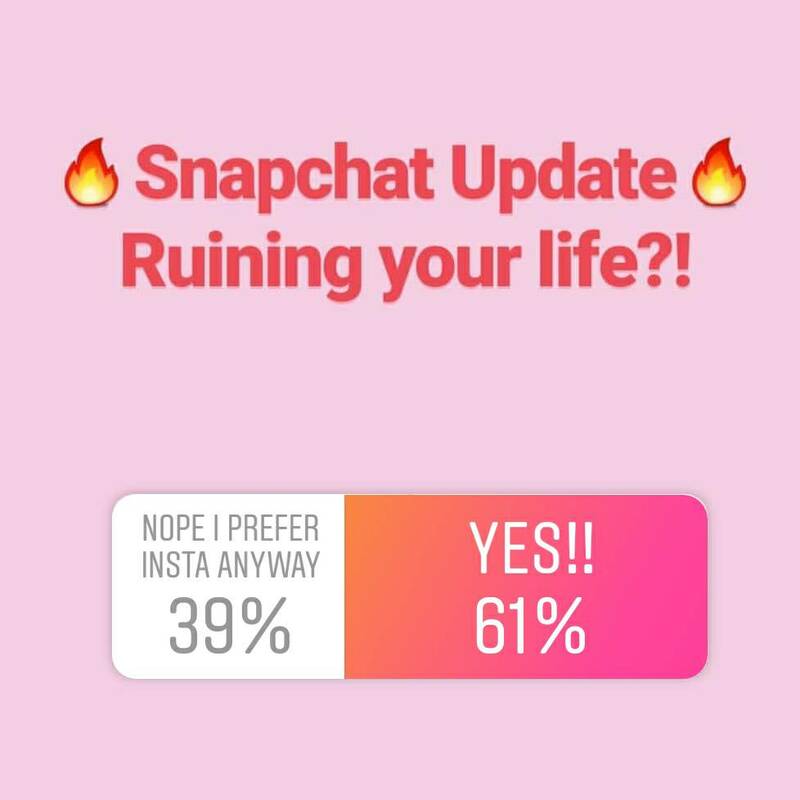 Where do I find… what is this… how do I… ok - well, just another reason for me to post everything on my Instagram feed and stories!” – we can be guaranteed this was not the desired impact Snapchat had anticipated. In the update, among many changes, Snapchat have mainly focused on separating “media content” from that of “friends” combining everything in a magazine type format on the ‘Discover’ page. When you swipe left on your screen, you'll see your friend's Snapchat stories mixed in with chat threads. Many users have deemed the changes, ‘cluttered and confusing’ finding it difficult to navigate, and unappealing to use. “While blurring the lines between professional content creators and your friends has been an interesting Internet experiment, it has also produced some strange side-effects (like fake news) and made us feel like we have to perform for our friends rather than just express ourselves." Snapchat cite reasons such as cutting down on ‘fake news’ and creating a clear division between media publishers (Sky, BBC, Buzzfeed etc) and influencer - type content creators (e.g. bloggers) from your real friends, helping users to have a more genuine experience on the app. It's no secret that Snap Inc (owners of Snapchat) have massive competition in Facebook owned Instagram, who copied their unique selling point by adding the Story feature in 2016. Instagram has more than twice the daily users of Snapchat and is backed by Facebook's large bank account, so Snapchat have to innovate in order to survive. Also let’s be frank, Snapchat is a business, and their goal like any other business, is to be profitable and sustainable. Last year, Snap Inc posted a net loss of $350 million, compared to a loss of $170 million, a year earlier. We, as social media users can sometimes dismiss (forget about) the fact that the social media platforms that we use (for free!) are also funded by our data (which we give quite freely) which is sold back to their advertisers. Without advertisers, there will be no profitability for social media apps, but without users, there is nobody to advertise to. What does this mean for Snapchat? It's a bit like when Lidl decide to change their layout, try as we might to resist the shocking change to our everyday lives (a touch dramatic for effect...) in the end, we have to just accept it.